Divine spot in between the countless castles along the rivers Indre, Cher, and Loire. This home built against the house of your host still offers you complete privacy! The ideal base from which you can visit all the beauty in the neighborhood. The interior is tasteful and comfortable with a beautiful ceiling with exposed beams and colorful bedrooms. Upstairs there's a salon with doors opening to the terrace, from which you have a view of the magnificent surroundings. A beautiful lawn next to the house where the children can play, and lovely rose bushes. 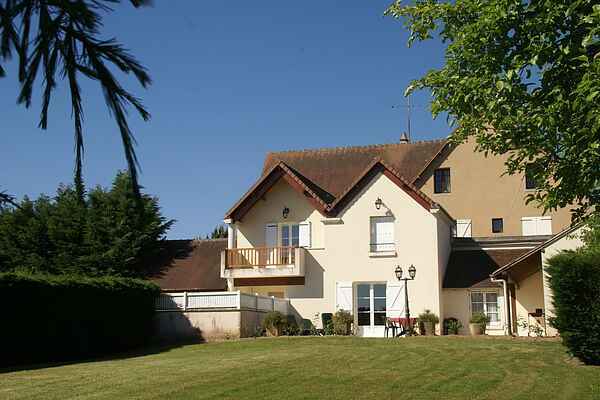 Around the corner there is a pétanque course, tennis courts, and a large heated pool that you share with several other houses, which we also rent out, and the owner. Bakery and grocer 1 km away. Restaurant in Luçay-le-Mâle (8 km). Forests with many options for hiking and biking: Forêt de Brossard (5 km) and Forêt de Gâtine (8 km). Sightseeing train ride from Valençay, with castle and gardens (10 km). Zoo (de Beauval), pedalboating on the Char, rent-a-bike, supermarket, and a market in St. Aignan (15 km). Swimming lake near Chemillé-sur-Indrois (20 km). Castles along the Indre between Loches (35 km) and Châteauroux (55 km).